Photographer Paolo Morales newest body of black and white pictures, “Between You and Me”, pairs staged and extemporaneous documentary-style photographs of people, landscapes and things that tenderly communicate the sensation of dislocation and isolation. With an acute eye for detail, Morales focuses his lens on fleetingly delicate moments captured in the American suburbs: the awkwardness that accompanies intimacy in human relationships, and still lives that act as visual metaphors for isolation. Taken together, the images serve as record of the small but indelible moments that punctuate daily life; moments that would otherwise be overlooked or dismissed altogether. Continuing her elegiac sculptural exploration of impermanence and immortality, artist Nara Park’s newest exhibition “What Remains” meditates on the sensation of loss and the fragility of life. 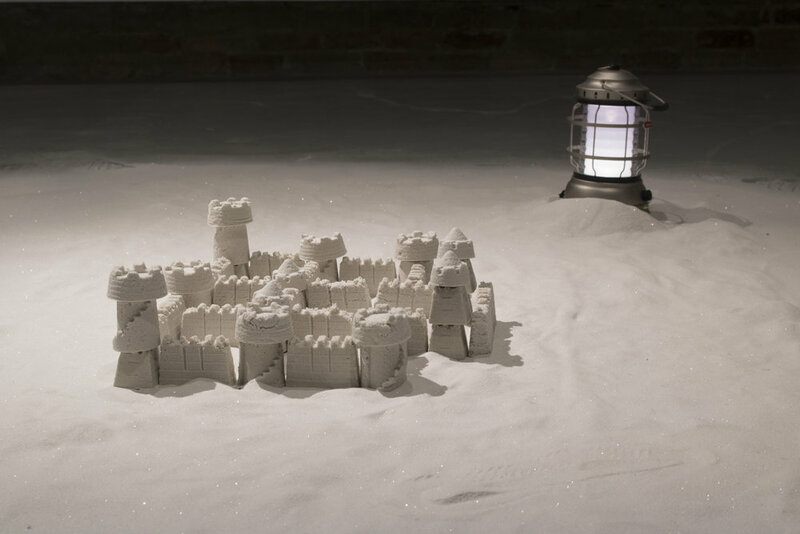 In “What Remains”, Park creates an installation comprised of monuments teetering on the brink of collapse: crumbling structures made up of razor-thin pieces of broken formica, shattered mirrors and objects made of sand. Park’s exploration of loss delicately plays with her signature trompe l’oeil techniques, creating an evocative world comprised of fragile false facades; seemingly solid forms that hang by threads, standing in for things and people lost to time, and what remains in their absence. Paolo Morales is a photographer. Born and raised in New York City, Morales holds an MFA in Photography from the Rhode Island School of Design (2015). Morales has exhibited extensively at venues throughout the US, including the Detroit Center for Contemporary Photography, Philadelphia Photo Arts Center, ClampArt, and Gallery 102 at The George Washington University. His photographs have appeared in Witness, Papersafe and Vice. He attended the Skowhegan School of Painting & Sculpture in 2015, Blue Mountain Center in 2016, and Philadelphia Photo Arts Center in 2017. He currently lives in Arlington, Virginia, and teaches at George Mason University and The Potomac School. Nara Park holds an MFA in sculpture from the Maryland Institute College of Art in 2013, where she received the Henry Walters Traveling Fellowship and the Outstanding Student Achievement in Contemporary Sculpture Award by the International Sculpture Center. Her work has been on exhibited in solo and group shows at the Kohl Gallery at Washington College, Chestertown MD; Grounds for Sculpture, Hamilton, NJ, Baltimore/Washington International Airport, Aqua Art Miami, Miami, FL and Rush Arts Gallery, New York, NY. Her work has been featured in the Sculpture magazine, The Washington Post, Huffington Post, and NY Arts Magazine. She lives and works in Washington, DC.